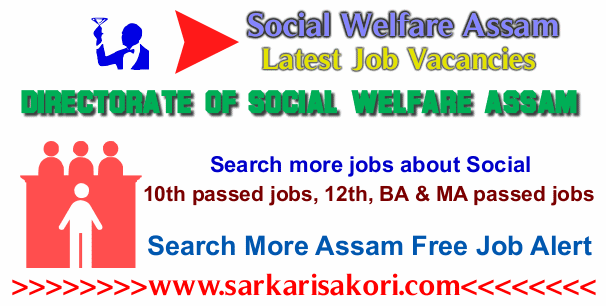 Directorate of Social Welfare Assam Recruitment 2018 for State Programme Coordinator & Assistant jobs under Department of Social Welfare Assam. Directorate of Social Welfare Assam Recruitment 2018 notification about for filling following State Programme Coordinator & Assistant jobs under Department of Social Welfare Assam. The posts have been created under the scheme “Pradhan Mantri Matritva Vandana Yojana (PMMVY)” on a purely contractual basis. No of posts: 1 No. Qualification: Candidates should be Post Graduate in Social Sciences/ Life Sciences/ Nutrition/ Medicine/ Health Management/Social Work/Rural Management. i. At least 3 years experience of working with the Government/ Non-Government organizations. ii. Proficiency in using MS-Office. iii. Proficiency in local language and English. Age: Minimum 18 years & maximum 38 years as on 01.01.2017 with a relaxation of 5 years in upper age limit for candidates under SC, ST(P), ST(H) & persons with disability category. Qualification: Candidates should be Graduation with Major in Social Sciences/ Social Work/Rural Management/ Statistics. i. At least 2 years experience of working with the Government/ Non-Government organizations. ii. Proficiency in using MS-Office, data entry, and analysis. No of posts: 27 Nos. Qualification: Candidates should be Post Graduate in Social Sciences/ Life Sciences/ Nutrition/ Medicine, Health Management/Social Work/Rural Management. i. At least 1-year experience of working with the Government/ Non-Government organizations. Qualification: Candidates should be Graduation with Major in Social Sciences/ Social Work/ Rural Management/ Statistics. Age: 18 to 38 years as on 01.01.2017 with a relaxation of 5 years in upper age limit for candidates under SC, ST(P), ST(H) & persons with disability category. The selection will be on the basis of Written Test followed by Interview and Skill Test. Name of Shortlisted candidates for the Written Test will be intimated through their respective Email ID as mentioned in their Application Form annexed herewith. The candidates who will qualify for the Written Test will be called for Viva-Voce & Skill Test. Interested and eligible candidates may apply in the prescribed application (application link available below) along with attested copies of certificates in support of educational qualifications, age, the percentage of disability, caste (in case of SC/ST/OBC candidates only) and experience should be reached the following given address within time. “To, The Director, Social Welfare, Assam, Directorate of Social Welfare, Assam, Uzanbazar, Guwahati-1”. Inspector of Factories Assam Recruitment 2018. Note: The schedule of Interview & Skill Test will be published in leading newspapers and will be posted on website www.socialwelfare.assam.gov.in. No separate call letters will be issued to concerned candidates. You will be interested more jobs about Social Welfare Assam Recruitment 2018.